Succulent, flavourful mixture of wild mushrooms. Great as antipasti or in risotto. Ingredients: Mixed mushrooms (oyster, chiodini, sanguinello, porcini), olive oil, wine vinegar, salt, lspices. Premium quality, succulent wild mushrooms in good olive oil. 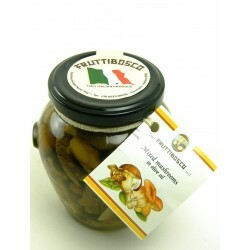 Delicious on a tray of antipasti, on mashed potato or in a risotto (use the oil to fry the rice).